Most of the moles and birthmarks appear within the first 20 years of our lives and they are usually not dangerous. However, those that appear later on in life present higher risk of developing into cancerous moles and therefore they should be looked at by a dermatologist. An excision of the mole is then sent for examination to determine if any of the samples collected is in any way dangerous and if there is a threat is associated with the mole (histological examination). 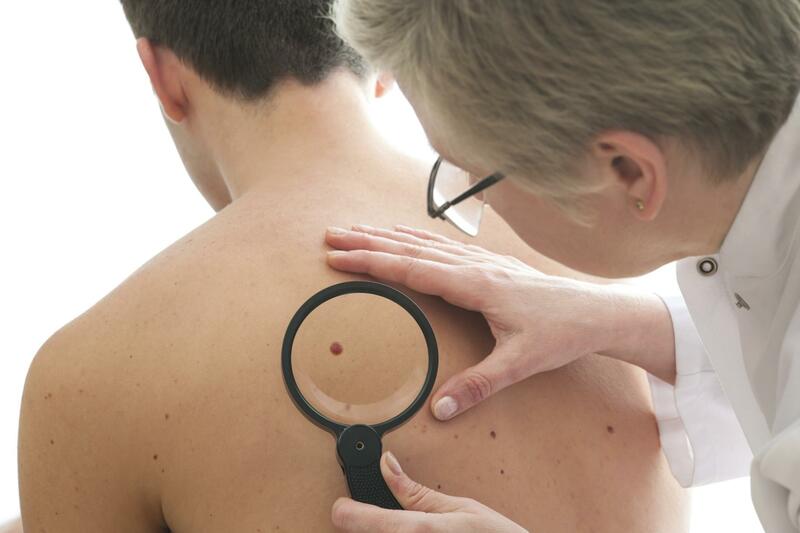 If a potentially cancerous mole or birthmark is not properly removed it can potentially aggravate risks to the client. Therefore if there is the slightest concern that a mole could be dangerous, the client should be referred to a specialist. The specialist will perform a biopsy and the mole will be sent for histological examination. This is the traditional method for removing birthmarks. This is the best way to remove a mole or birthmark that have chances of being cancerous. The birthmark itself is removed as well as a part of the surrounding healthy skin (biopsy). This is necessary for histological examination. The histologist needs to examine both the birthmark and the healthy skin to make sure they will able to make an appropriate diagnosis. Manual excision will almost always result in scarring, therefore it is now only used if the mole appears to be dangerous and there may be chances of further developments. The technique used to remove moles for aesthetic reasons is to ablate the skin lesion superficially. The ablation is generally carried out until the mole is "flattened". In other words, the mole is burned (or vaporized) superficially until it is level with the surrounding skin. In the video below we can see an example of mole removal using a cosmetic laser. This easy procedure is carried out by setting the device a relatively high frequency and repeating the vaporization of the mole a number of times, until achieving the desired results. As you can see the practitioner rubs the finger on to the mole a number of times to appraise whether the mole is level with the surrounding skin. This method is used achieve the best possible aesthetic results and minimizing the likelihood of scarring. The technique we have to see above is oversimplified because there are several types of moles (or more in general benign skin lesions). Some moles require a deeper ablation than others. This depends on how the benign mole grows inside the skin. As we will see in Xanthelasma, for instance, these lesions can grow deeply inside the skin, while some other like seborrhoeic keratosis is very superficial. However, when the practitioner is not sure about the way the of the specific benign mole has grown inside the skin, the leveling method is preferred as this minimized the likelihood of scarring. There are many ways to remove benign moles and the use of AC electrical arc is one of them. Like aesthetic lasers, voltaic arc (also referred to as plasma) allows easy removal of benign birthmarks and moles. If the mole is removed properly and the aftercare is followed, the risks of scarring are very low, however, a minor likelihood of scarring exist despite the method used and cannot be completely ruled out. This type of procedure can be performed by a healthcare professional as well as a beautician or any other appropriately trained non medical person as long as the mole is benign and removed for cosmetic or comfort reasons. There are several types of benign growths which are referred to as benign moles. As a general rule in order to minimize the risks of scarring it is recommended that the mole removed is leveled off with the surrounding skin area. Remember that no guarantee can be made of a scar-free outcome despite the method or device used to remove the benign skin lesion. Certain particular types of benign growths maybe rooted between the dermis and the epidermis and may require a specific technique to remove them in one session only. Having the knowledge of the type of benign lesion you are dealing with, will help you in the effective removal of the lesion is a single session. If the benign lesion is rooted between the dermis and epidermis, a slightly deeper ablation (or burn) may be required to remove the lesion in one session only. If these more deeply rooted moles are leveled off with the surrounding skin area, multiple sessions may be required to remove them effectively. Generally, moles can be effectively and quickly removed by burning them off using AC electric arc by starting from the top and working all the way down to level them off with the surrounding skin area. Particularly thick moles maybe better removed with the device set at the maximum power level in order to remove the bulk of the mole effectively within a reasonable timeframe. Normally experienced users set the device at the top power level to coarsely remove the main bulk of the thick mole. However, when you first start using the device it is advisable to apply the arc at a minimum power level or generally low power settings, in order to gain confidence with this type of procedure. Also, if you are a first time user of AC electrical arc, after every voltaic arc short spray, wipe the carbon residues away by using a cotton pad impregnated with nonflammable antiseptic to clear the carbon residues. This will allow you to get used to the amount of mole ablation possible with the device set at the predetermined power level. When the carbon residues are cleared you can see the level you have reached. You can also feel the remainder of the mole to be removed by running the tip of your finger on the mole you are removing. As long as you feel a small bump this means that you still have some work to do to level it off. Start reducing the power level of the device to the minimum setting, when, after touching the mole you feel that bump is very thin and you are about to level off the mole with the surrounding skin area. This is because reducing the power level will allow a higher degree of accuracy in the ablation of the mole. The lower the power level the higher the degree of precision you will be able to operate in the leveling off of the mole. The more experience you gain the more confidence you will be in the removal of the mole. When removing small and thin moles, low power levels may suffice to remove the small moles quickly. If you suspect a mole to be thin it is advisable to ablating the mole by using the lowest power level. You may also find that for small thin moles a short spraying on the top of the mole will suffice to remove them. Always wipe off the carbon residues after every burst especially when you with start removing moles using voltaic arc. → Make sure that the mole your client intends to have removed is a benign growth. → Explain the content of the consent form and have it signed by the client. Explain that there are no guarantees that a scar may not replace the mole after removal. → Take before pictures of the moles and store them electronically, they will turn out useful in the future. → Apply numbing cream on the mole. Follow the instructions of the numbing cream supplier. → Once the area is numb, wipe the cream residues away and start removing the mole. → For thin moles use the device set at minimum power setting and wipe off the carbon residues after each spray burst. You may find that in some cases the thin mole is completely wiped off after a short spray burst at minimum power. → Apply the appropriate soothing product and antiseptic immediately after the removal. → Emphasizing its importance, hand out the appropriate aftercare information sheet to the Client. → Explicitly instruct the client not expose the area to potential infections. → Explicitly instruct the client to use sunscreen and avoid direct sun exposure up to 3 months after the treatment. If you want to watch examples of how moles are removed using AC electric arc please refer to the many videos on mole removal in our channel. The latter method has been very effective, however, it is still possible to remove thick moles by applying the tip of the electrode by starting to apply the arc from the top and work all the way to the base or the benign mole. It is important to notice the difference between the electrofulguration technique used in these videos and electrodesiccation (also sometimes referred to as electrolysis). When using electrodesiccation for tag and mole removal, these benign lesions are removed by inserting the needle into the mole and subsequently burn the mole from the "inside", however in the case of electrofulguration, the electrode is not in contact with the mole and the ablation is caused only superficially by the use of the electrical arc.